The team behind Diapers.com has made a new e-commerce site aimed at the other baby in the American household: the family pet. Quidsi, which is now a wholly-owned subsidiary of Amazon.com(s AMZN), is announcing Wednesday the launch of Wag.com, an e-commerce site selling pet-related products. Quidsi also runs Diapers.com, Soap.com, and BeautyBar.com. Don’t be fooled by the name — Wag.com’s offerings will go way beyond dog treats, marketing director Earl Gordon and site leader David Zhang told me in an interview this week. 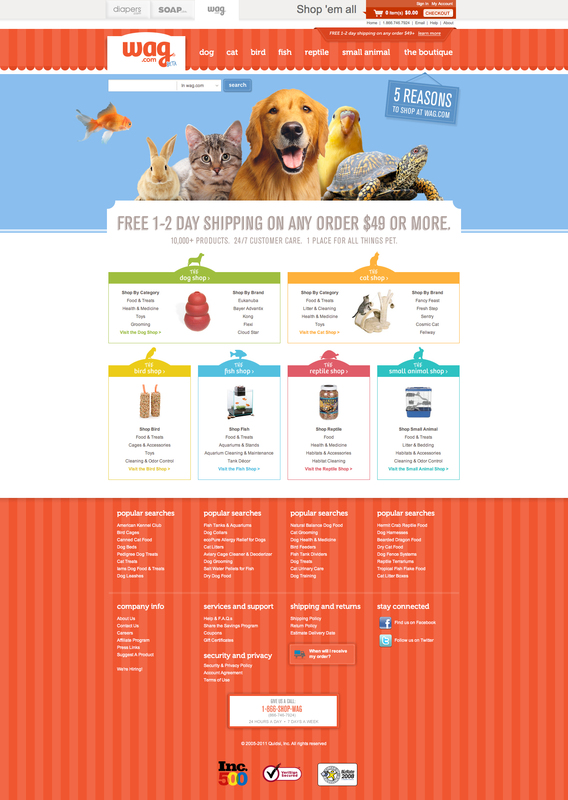 The site will launch with more than 10,000 products for dogs, cats, birds, fish, reptiles and other small animals. The offerings will include mass and specialty branded food, litter, toys, vitamins and medicine, grooming supplies, clothing and accessories. Like all of Quidsi’s sites, Wag.com will only be available to shoppers within the United States. The company promises its orders will be delivered within 1-2 days, with free shipping on orders over $49 — and no surcharges or exclusions for heavy or bulky items–a plus when buying those 30-pound bags of food for Fido. Quick perusal of their products and their prices are a rip off. Dog food is 70% higher than buying at Walmart… doesn’t matter if shipping is free if the prices are ridiculous! Are you comparing brand to brand prices? Wag.com carries lines of higher quality pet food not traditionally available at walmart.